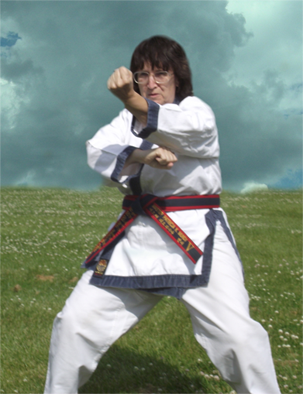 Master Patricia Mundy, 6th Dan, started her martial arts training in 1981 with weapons fighting. Upon realizing that it was too impractical for her to carry around a medieval weapon in modern society, she decided to switch to unarmed martial arts. Moving to Southfield in 1989, she saw a Karate class offered through the city's Parks and Recreation program. She joined Kim's Karate and Hap Ki Do Academy in July of 1990 and has been a member of the World Traditional Tang Soo Do Federation since that date. After the local school was annexed into the Michigan Academy of Martial Arts (M.A.M.A.) in 1997, she continued to train reaching 1st Dan and Head Instructor status of the Southfield branch of M.A.M.A in 1999. Master Mundy earned a B.A. degree in Secondary Education from Western Michigan University in 1980. Her teaching experience includes English (grades 9-11), Spanish (grades 7-12), Drama, Yearbook Publication, Adult Basic Ed, American Citizenship for Foreigners, ESL, and Pre-School Physical Ed. She has been a Girl Scout Leader (Daisy and Brownie) and has also worked closely with a Junior Girl Scout troop. weapons forms in Royal Oak and Utica.